Another popular function group many applicants are going for on EPSO is the EPSO AST and its close cousin, EPSO AST-SC. Suffice to say, this competition opens up multiple job opportunities that enables many people to explore various job titles. So if your interest is peeked with this competition organized by the European Personnel Selection Office (EPSO), then it helps to understand more about what these two competitions are about—from their similarities to their differences. And we are here to help with just that! What are EPSO AST and EPSO AST-SC? EPSO AST and EPSO AST-SC competitions give access to permanent contracts that enable you to become a member of the EU civil service. As such, they are awarded after a rigorous open competition procedure. Both the EPSO AST and EPSO AST-SC have distinct types of duties, sometimes some even overlap. Nonetheless, it is a must to learn how to separate the two in order to know which one best suits you. 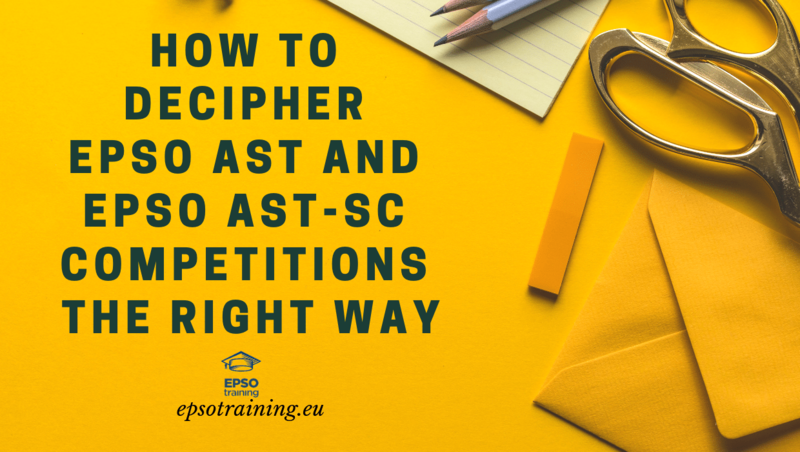 On the other hand, the EPSO AST-SC function group is for the open competition organized for the European Personnel Selection Office to draw up reserve lists from which the institutions of the European Union may recruit new members of the civil service as ‘secretaries/clerks’ (function group AST-SC). What Do the Different Grades Mean for EPSO AST and EPSO AST-SC? The assistant career or EPSO AST ranges from grades AST 1 to AST 11. The level of entry is at grades AST 1 or AST 3. AST 1 – candidates must have completed secondary education and have previous relevant experience, or have a relevant vocational qualification. AST 3 – candidates should have completed secondary education, a relevant vocational qualification and/or several years’ relevant experience. As with the EPSO AST, EPSO AST-SC starts with AST/SC 1 but ends with AST/SC 6. New staff enter at the grade AST/SC 1 or AST/SC 2. AST/SC 1 – candidates must have completed secondary education and have previous relevant experience, or have a relevant vocational qualification. AST/SC 2 – candidates with more experience (minimum 4 years). What Are the General Eligibility Requirements for the EPSO AST and EPSO AST-SC Competitions? Beyond the requirements that will identify what grade you will be in for the EPSO AST and EPSO AST/SC competitions, there are also some very important eligibility requirements that you must exhibit in order to qualify for the competitions. EPSO AST competitions vary greatly according to the job title you are pursuing. Hence, it is important to refer to the Notice of Competitions published in the Official Journal of the EU. It is the official and authentic document that specifies the details and conditions of the competition such as the kind of skills you should have akin to the nature of the job. Applicants must be an EU citizen. Applicants must not have any criminal record. Applicants must have the ability to speak at least 2 of the official EU languages. Applicants, if applicable, must have fulfilled all military service requirements. Applicants must meet the character requirements for the duties concerned. Professional training (equivalent to European Qualification Framework Level 4) of at least 1 year, followed by a minimum of 3 years’ professional experience. Both the training and experience must be directly related to the nature of the duties. At least 4 years’ additional professional experience directly related to the nature of the duties. Selection Process: What Are the Exams Needed to Be Taken for the EPSO AST and EPSO AST-SC Competitions? Given that you have validated the second part of your application form in your language 2, you will then be invited to sit a series of computer-based MCQ tests in one of EPSO’s accredited centres. Note: These tests are eliminatory and do not count towards the other tests held during the assessment phase. Once you meet the eligibility requirements and reached the pass marks and also scored of the highest overall marks for the MCQ tests, you will then be again invited to attend an assessment phase held in your language 2. What Are the Benefits and Salary for the EPSO AST-SC? The basic monthly permanent official salaries for newly recruited Assistant-Secretary (AST-SC 1) range from around €2,300 per month to around €5,000 for an Assistant with the highest seniority. Automatical salary increases happen every two years corresponding with the five seniority steps of each grade. Also, basic salaries are adjusted annually in line with inflation and purchasing power in the EU countries.